When we believe the future is uncertain, we often get skittish, nervous, and anxious. In the face of rampant uncertainty most of us hunker down, fall back on old habits, and minimize risk-taking. Historically, strategic planning was all about focusing an organization’s attention on a particular marketplace and ensuring that it had the operational capabilities to compete effectively in that market segment. Most strategic plans make explicit assumptions about future trends and probabilities, and they usually include educated guesses and formal statistical projections about what the planners expect will happen. However, in today’s highly volatile and unpredictable world, assuming any kind of predictability could be fatal. Traditional strategic planning is worse than useless when dealing with the uncertainties of today’s economy. Indeed, traditional thinking about the future, as if it were actually singular and knowable, can be downright dangerous. The best way I know to embrace uncertainty and engage in constructive, collaborative speculation about the future is called scenario planning. Scenarios are stories about the future that, when taken together, describe a range of plausible future states of an industry, its markets, and a particular business. Scenarios are a tool for dealing with rapid change, uncertainty, and inherent unpredictability. Scenarios are not predictions of the future; rather, they are images of possible futures, taken from the perspective of the present. 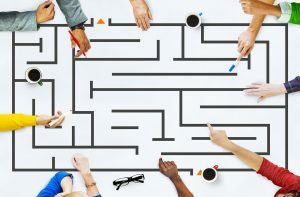 Because scenarios are developed explicitly to describe a range of possibilities, they help organizational leaders open their minds to the inherent uncertainties in the future, and enable them to consider a number of alternative “What-if?” possibilities without immediately needing to choose or commit exclusively to any one most-likely outcome. Scenario analysis enables managers, business planners, and executive teams to develop multiple options for action that can be compared and assessed in advance of the need to implement them. An effective scenario suggests critical implications for the organization and contains personal meaning for the people who build it. Scenarios are useful tools primarily because they facilitate—indeed, require—a strategic conversation about the unpredictable outcomes of the rapidly changing business environment. For example, many of us, and many organizations, have given a great deal of thought to the alternative futures that could follow the election of one or the other of the two US presidential candidates. I’m actually willing to bet that most of us have cast our votes based in large part on the alternative scenarios we’ve imagined of what life after the election might be like, and what we think is the likelihood of either of those scenarios coming to pass. Scenario planning is the best way I know to overcome the appalling absence of executive conversations about the future that I mentioned last week (“Taking Charge of Tomorrow: The Most Important Question in the World”). If you want to build a collective, collaborative view of the future and its implications for your own organization, invest in a scenario planning conversation. Portions of this article were adapted from Chapter 7 of Making Meetings Matter: How Smart Leaders Orchestrate Powerful Conversations in the Digital Age (link is to the book’s page on Amazon.com. However, you should contact me directly for volume discounts). Chapter 7, “Designing and Leading Extraordinary Meetings,” includes descriptions of several approaches for generating meaningful executive conversations about the future, whether it is predictable or not. Call me today (+1 510.558.1434) for a free exploratory conversation about how you can become a hero by designing meetings that prepare you and your organization for an unpredictable future. Isn’t it time to upgrade the quality and the effectiveness of all your meetings?